My dad came down to Florida to visit for a few days and I know he likes fish so I whipped this one up for him after getting him from the airport while he enjoyed the warm weather and the sunset. 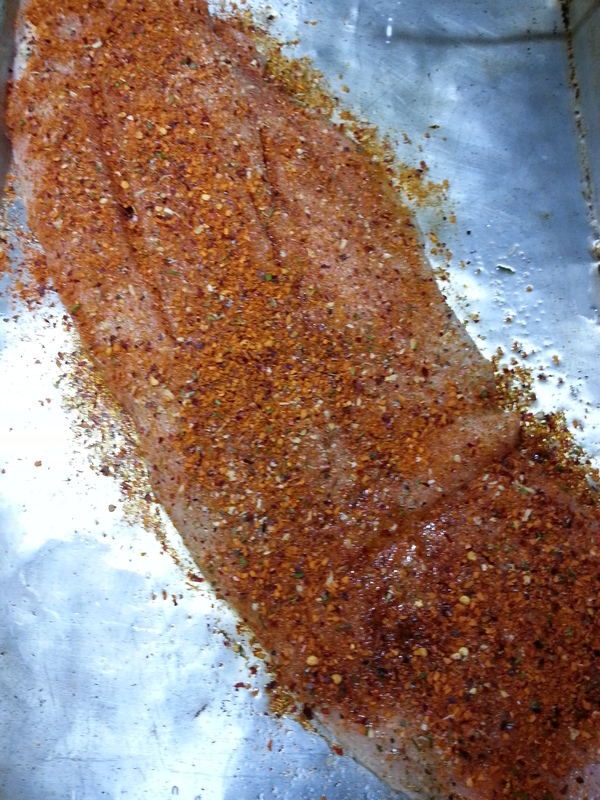 Lightly oil a sheet pan and heavily season both sides of the fish with blackening seasoning. 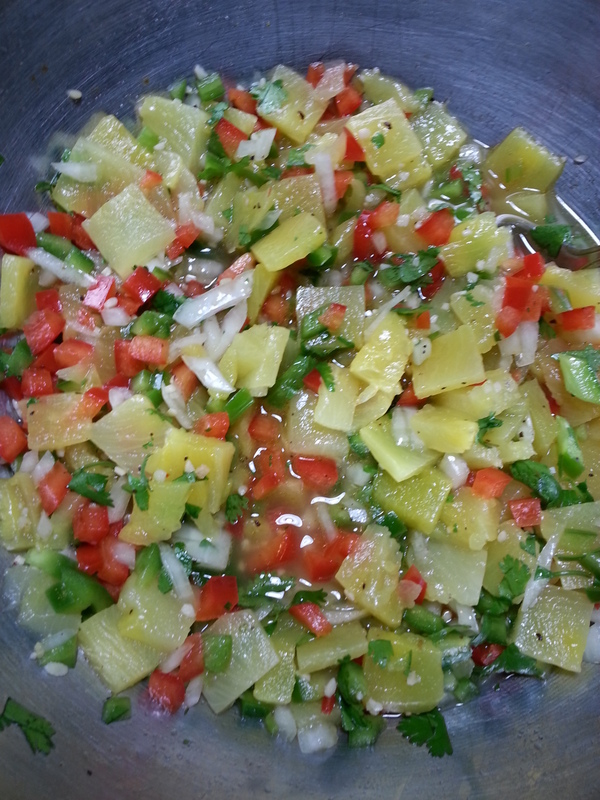 Peel a nice ripe pineapple and cut into small pieces, toss into a mixing bowl add 1 of each finely diced red & green peppers and ½ of a red onion, 1 jalapeño finely diced, ½ cup of good quality olive oil, 1/4 cup fresh squeezed lime juice, a bunch or so of cilantro (some people love it and others hate it, it is up to you) and some salt and pepper. Mix well and set in the fridge of about an hour. 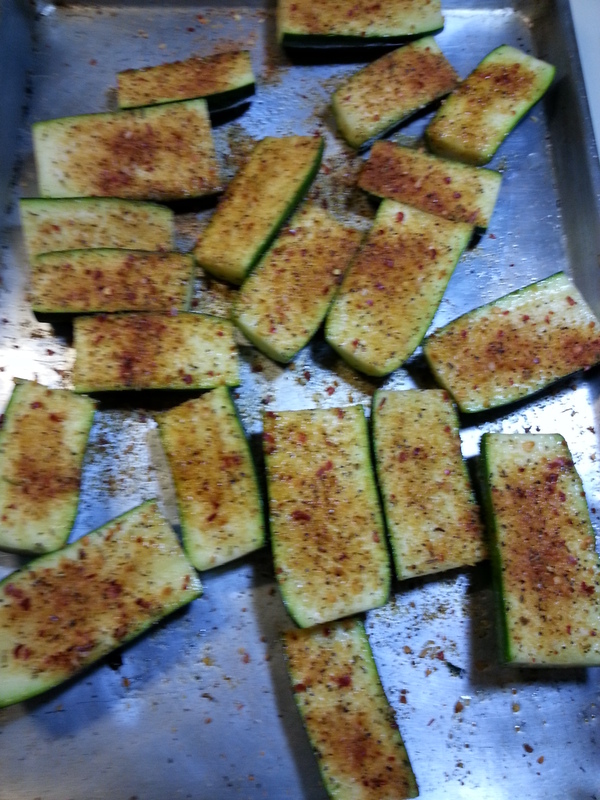 I had some zucchini in the fridge so I cut it up, rubbed it with some olive oil and dusted them with some seasoned salt. Headed out to the grill and fired it up on high. 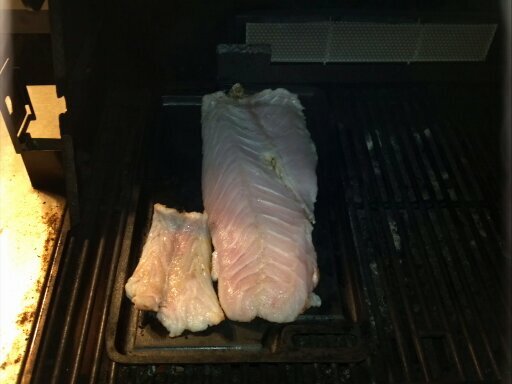 Put the fish on a pan onto the grill and close the lid. Cook for about 10 minutes then flip over while you cook the zucchini on the other side of the grill maybe for another 10 minutes. You will know the fish is cooked when it flakes apart. 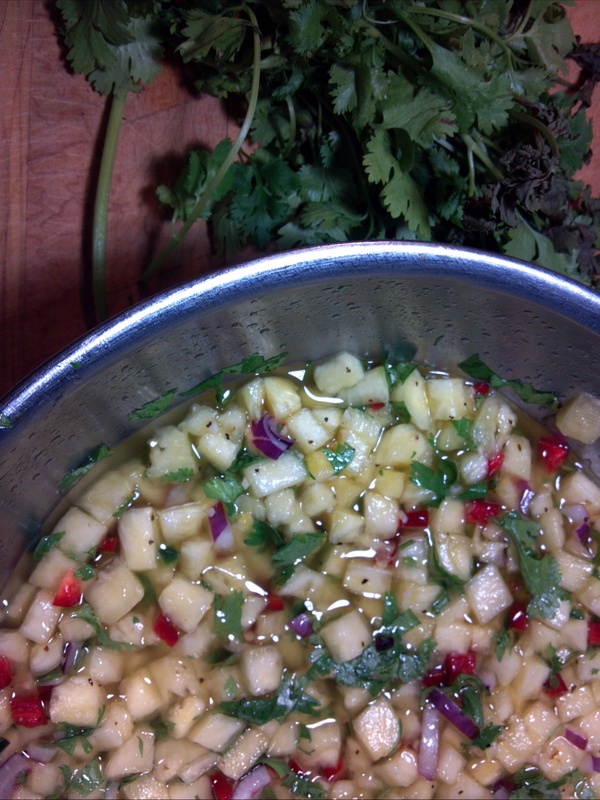 Take the pineapple relish out of the fridge before you head out to the grill so it comes to room temperature. 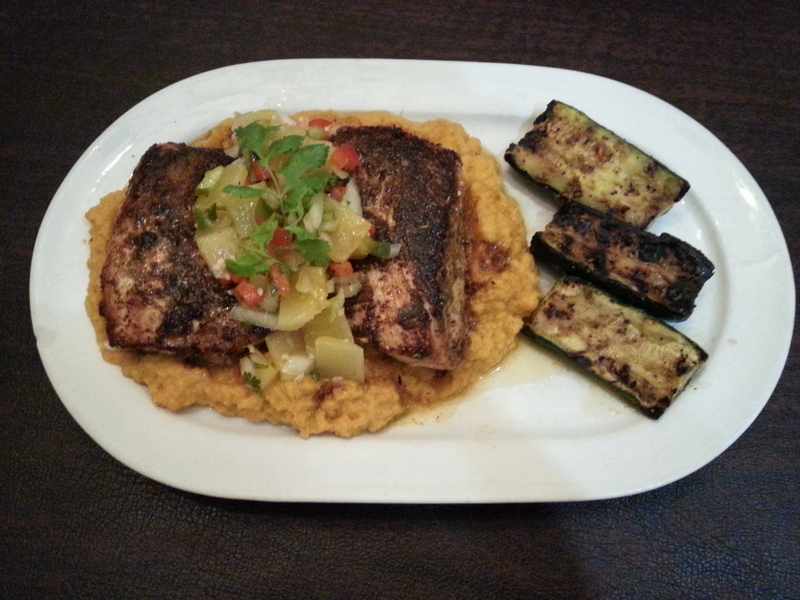 Today for dinner as you can see I served the blackened fish over some sweet potato mash with the pineapple relish and the grilled vegetables. 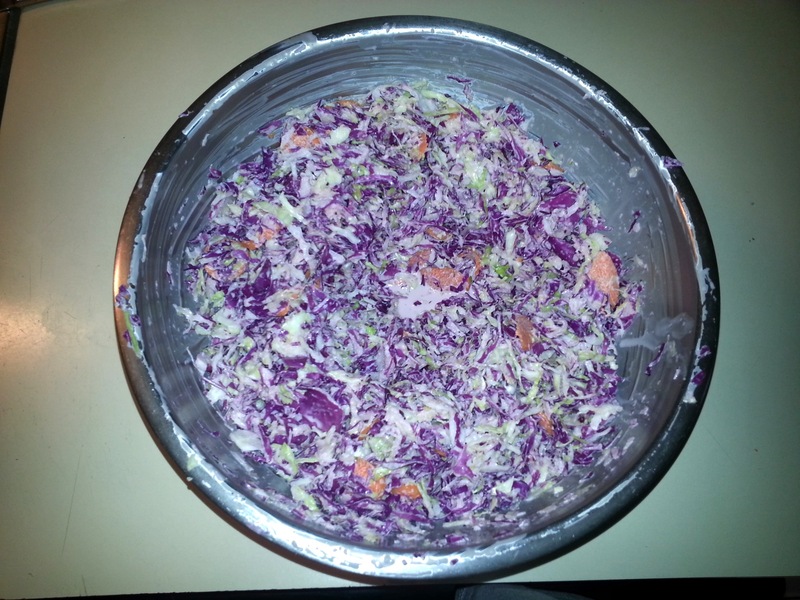 Sometimes homemade is better than store-bought so this is how I make coleslaw. 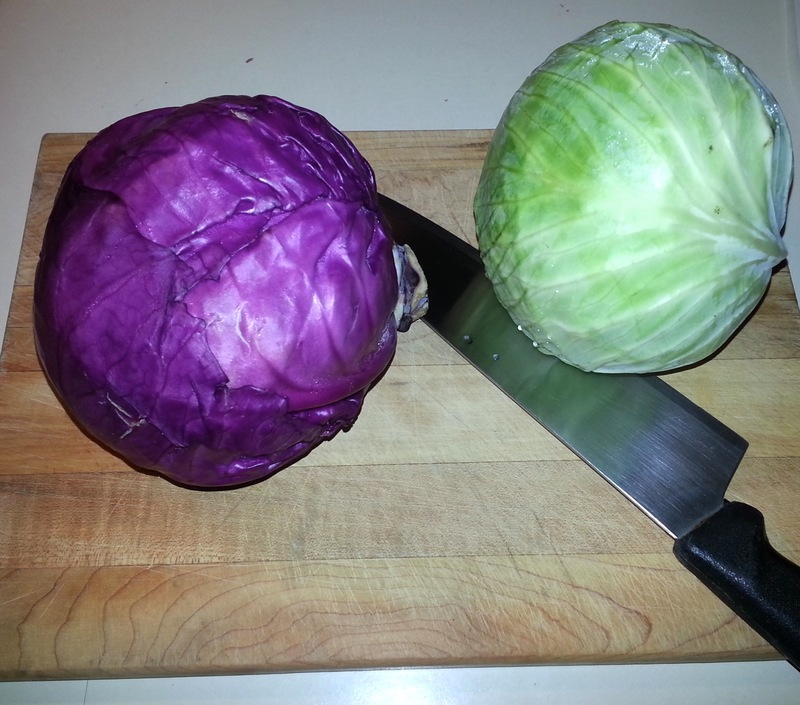 You will need 1.5 pound head of red and green cabbage. In a big bowl add 1.5 cups of mayonnaise. Mix with ¼ cup of milk, 3 tbsp of sugar, salt, pepper and a dash of celery seeds to taste. 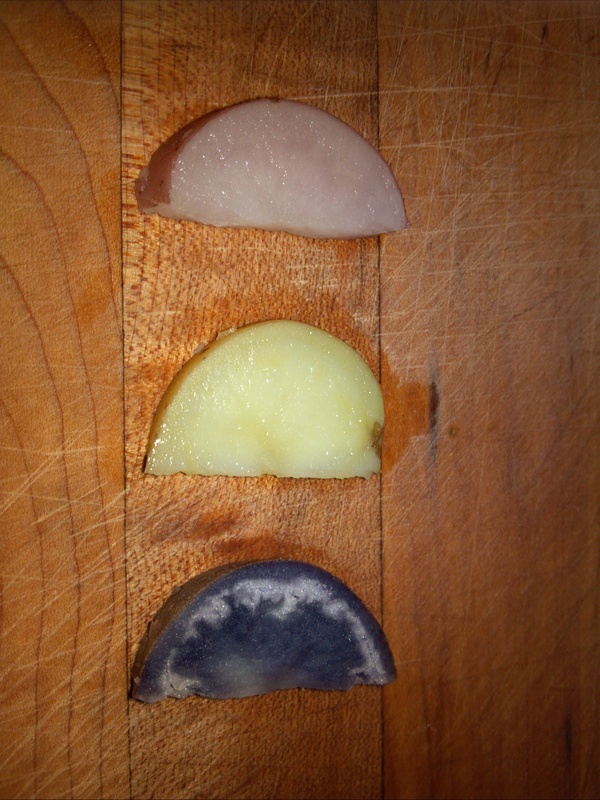 Cut the cabbage in half and take out the core. Cut into wedges as you can see in the background of the picture above, from the wedges cut them into small strips or run them through a food processor. 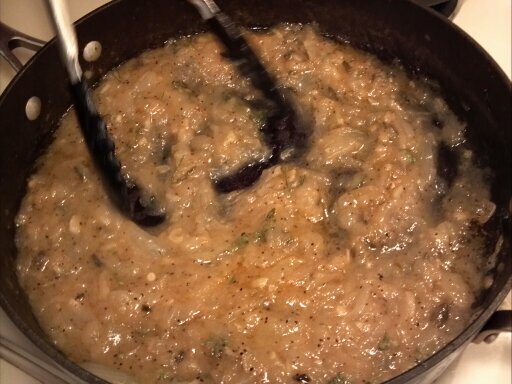 Add all the cabbage to the big bowl, mix thoroughly and let rest in the fridge for a ½ hour, then mix again to make sure everything is combined together. Make sure to taste it at this time and adjust the salt & pepper or sugar. Cover and store in the fridge. Remember as it sits, the moisture will leach out of the cabbage causing the coleslaw to be wetter at the bottom of the bowl. Just stir everything together before serving. In our case, we had some sliced carrots I just threw in at the last-minute. You can also make it yours by adding raisins, cranberries, apples, pineapples, or even blue cheese. 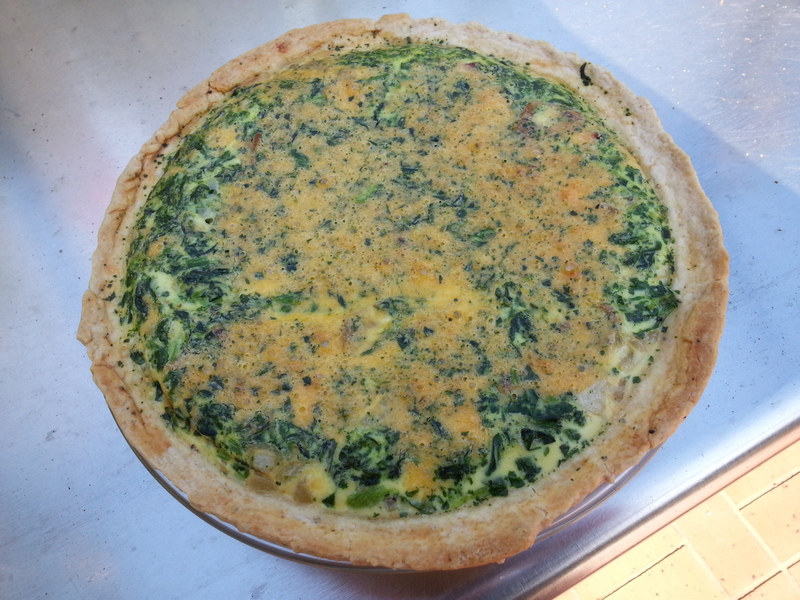 For a nice weekend brunch or even a light weeknight dinner a quiche always works. You can change the fillings and spices to have something different every time. My wife makes the dough as she enjoys baking. 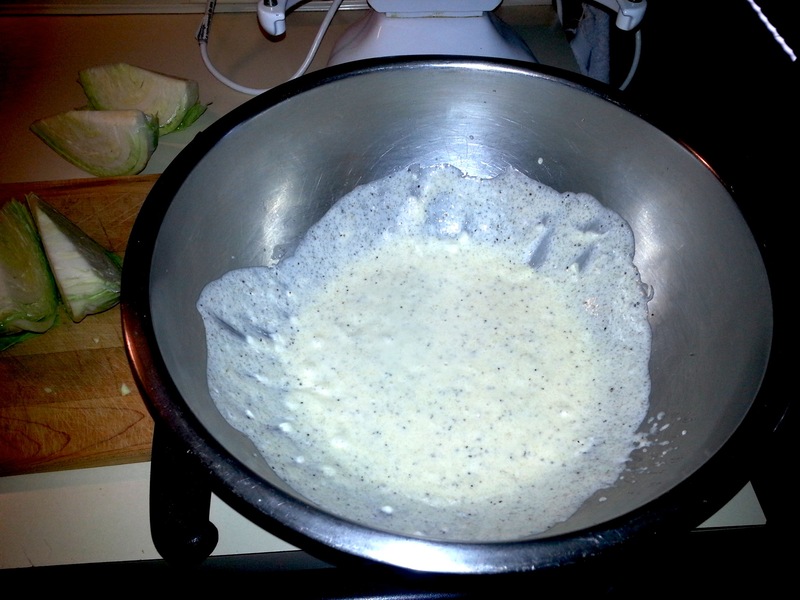 Mix the flour, salt and pepper together. Add in, alternating, the butter and shortening into the flour. Using a dough blender or a fork, combine until the dough is coarse pebbles. 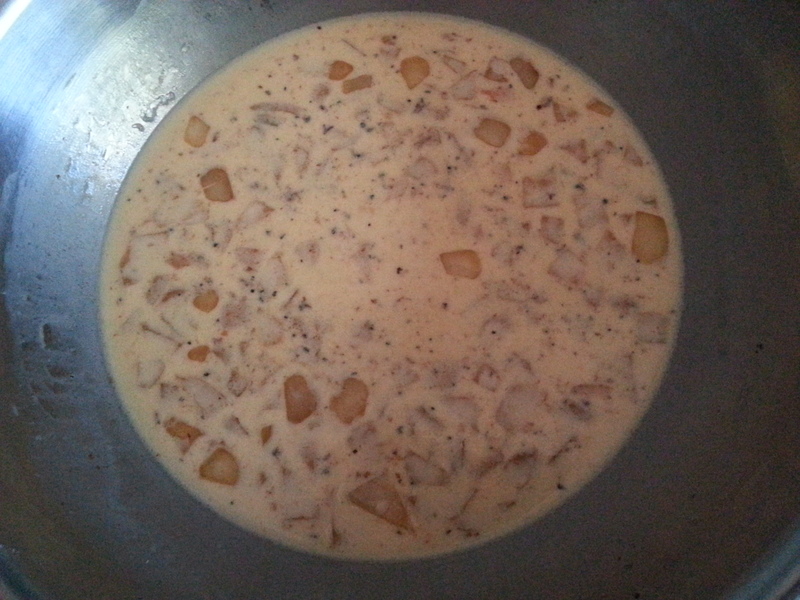 Add in 4 tbsp of milk and bring the dough together in a ball, if it is still dry, add more cold milk. Take the dough and wrap with plastic wrap and place in the fridge for about 30 minutes to chill. Roll out the dough and place in a nine in pie plate. In a large saucepan cook the bacon until crispy, place them on a paper towel to drain any excess oil. Do not discard the bacon grease left in the pan. Chop the bacon into chunks. In the saucepan add in the onions and garlic and cook until softened. Remove from pan. In a large bowl whisk the eggs and milk. Stir in salt, pepper, onions and garlic. 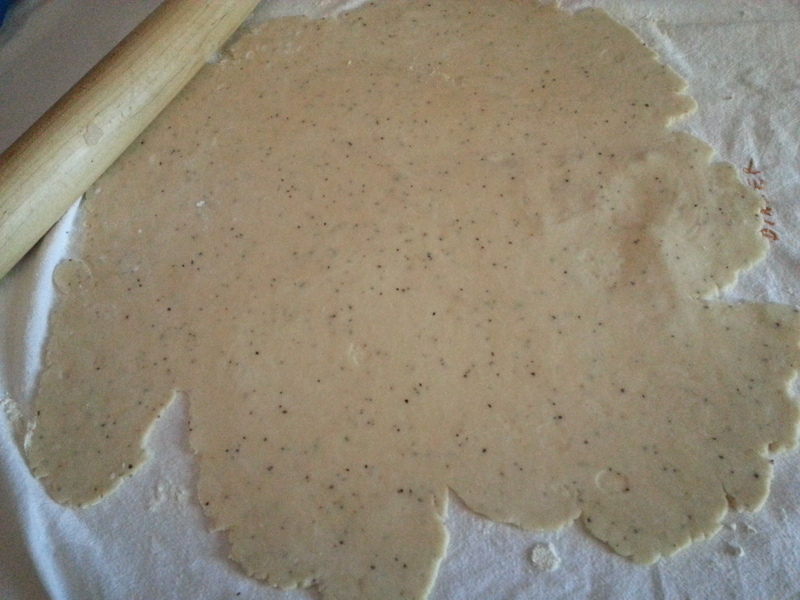 Place the egg mixture in the rolled out dough in the pie plate. 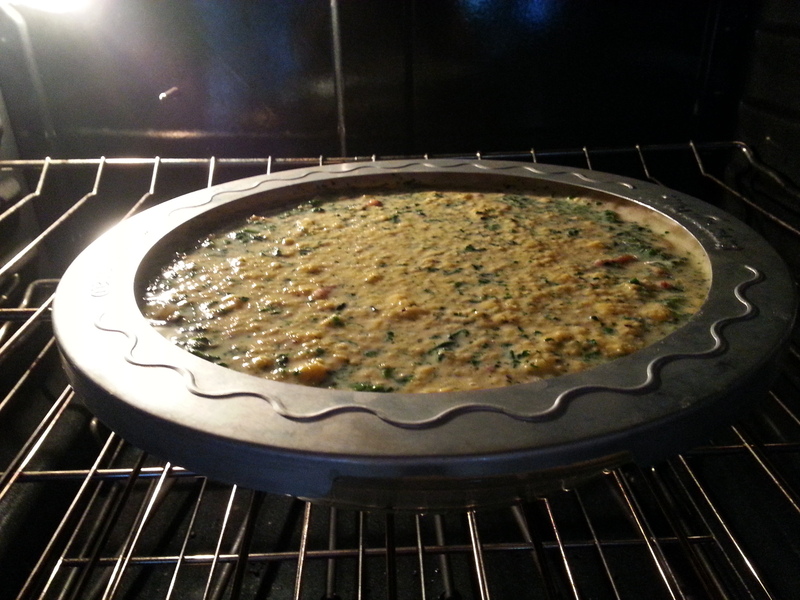 Place the chopped bacon, cheese and spinach carefully in the egg mixture. Cook at 375 F for about 35-45 minutes until eggs are set. 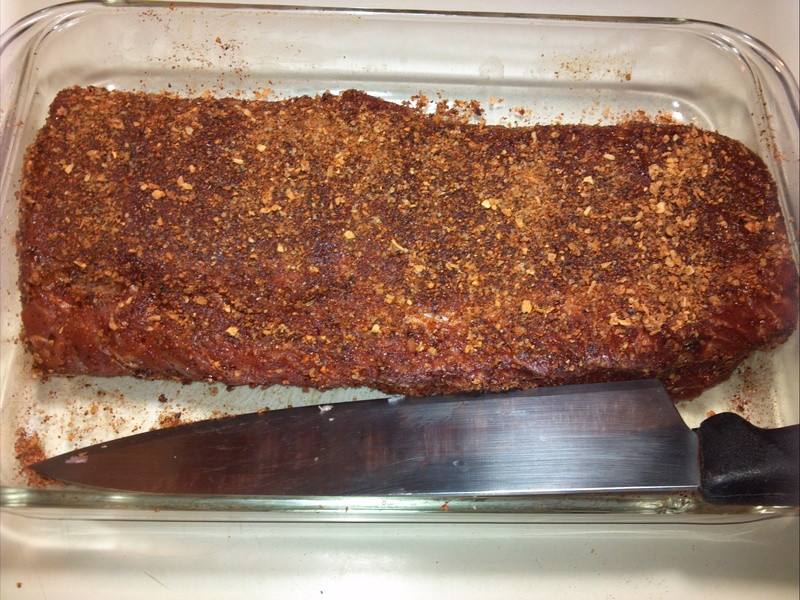 Using the pork we loin we cut up last time, we will leave this whole and rub it with my home-made rub. Then place it on the rotisserie. 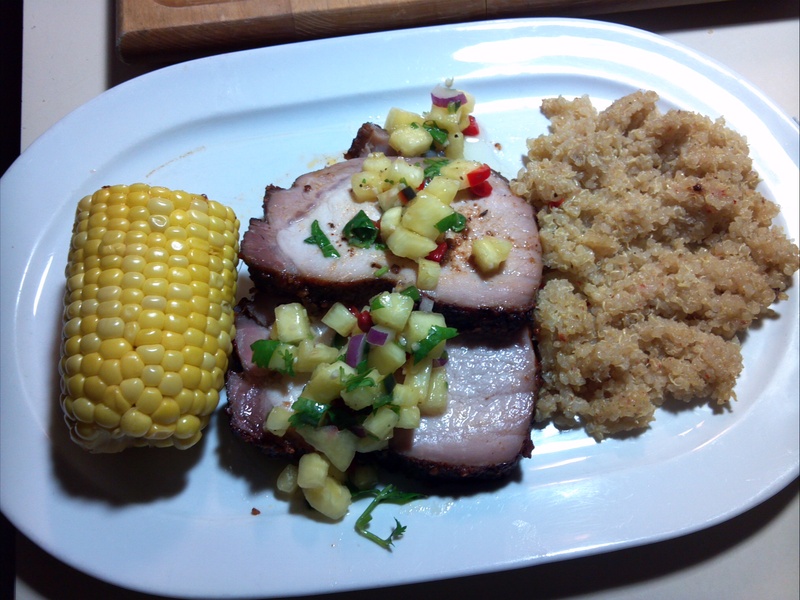 So while the pork is cooking I had a pineapple to use up, so I made a pineapple relish so here is how to do this: 1 pineapple cut into fine dice, one red pepper fine diced, 2 jalapeno deseeded and diced super fine, ½ cup of good olive oil, 3 limes juiced, and a large bunch of cilantro cut from the garden and some salt & pepper to taste. 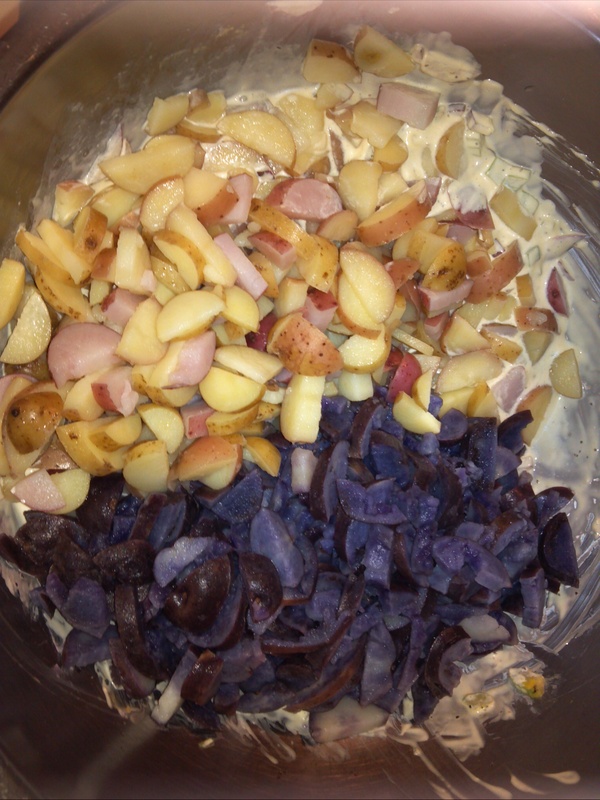 Mix all together and let sit for at least an hour in the fridge to let the flavors mix. 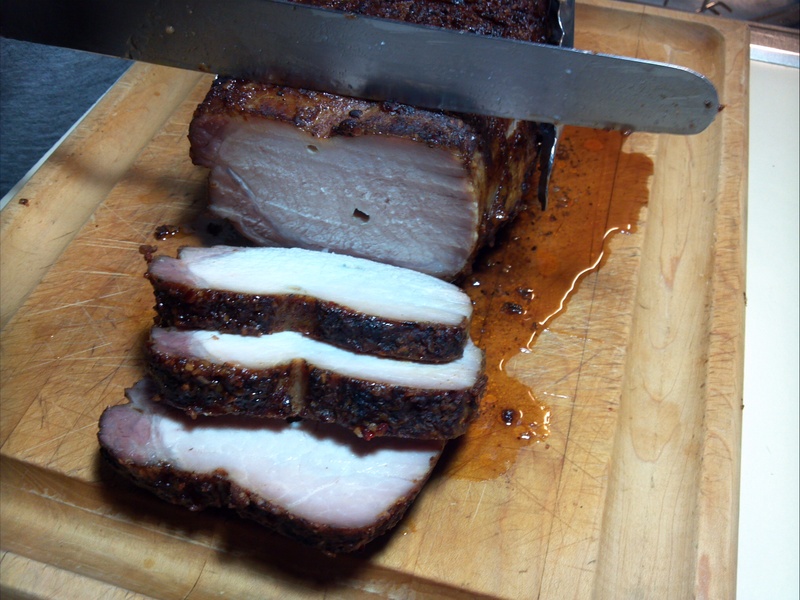 Cook the meat until it reaches at least 155 F – 165 F and let it rest for 10 minutes before cutting. I also had some left over quinoa I reheated with some butter and served the meal with some fresh corn from the farmers market. 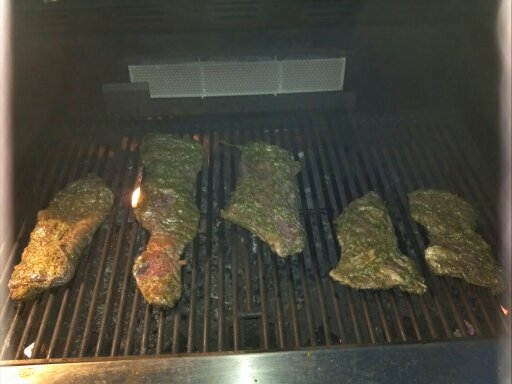 To start marinate some skirt steak in your favorite seasonings, here I had some frozen left over chimichurri sauce that I found in the back of the freezer, set that aside. Cut about 3 onions into small strips put in a pan over medium low heat with 2 tbsp of butter and oil sprinkle with salt and pepper. 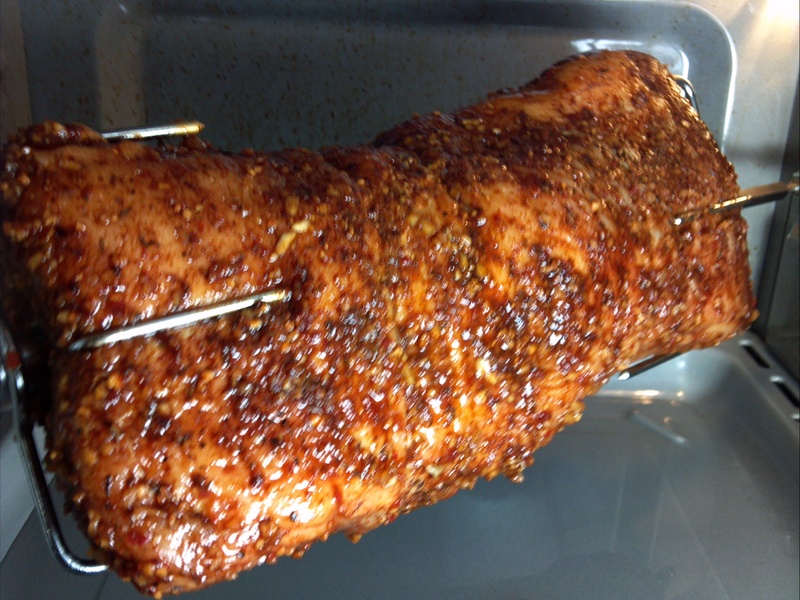 Cook until soft about an hour until nice and caramelized. Add 1 jalapeño that has been cut in half and the seeds taken out sliced thin and the juice of 2 limes to the onion mixture, check for salt and pepper, set aside. 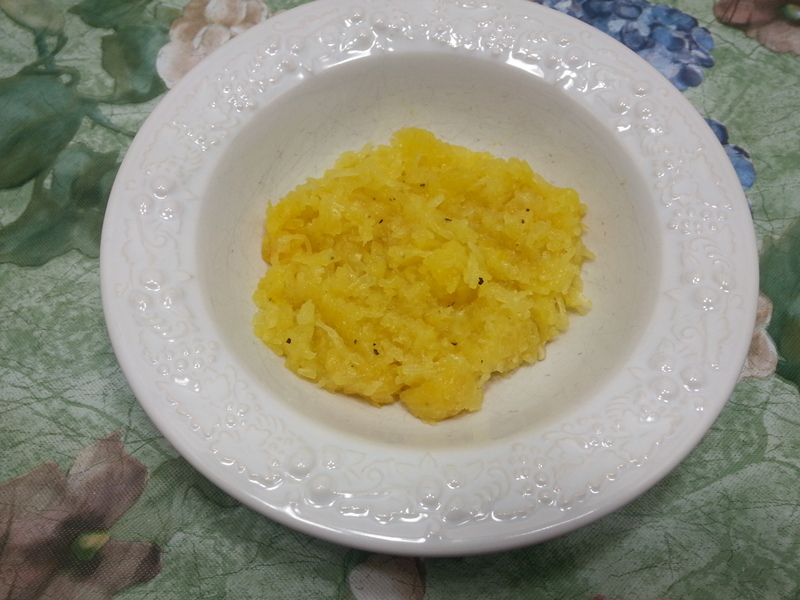 Make however much yellow rice to go along with dinner. Remember its 2 cups of water to every cup of rice. 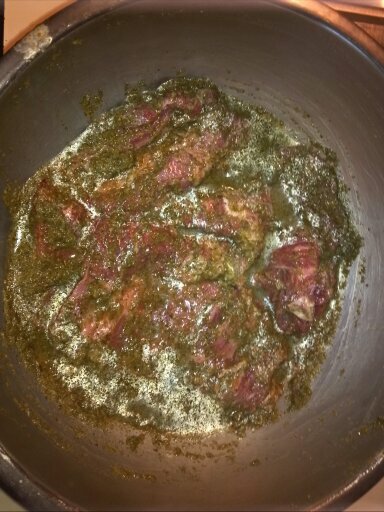 Add some butter, Adobo seasoning and pepper to the pot, bring to a boil then cover and reduce temperature to a simmer. Cook until the rice is done to your liking. 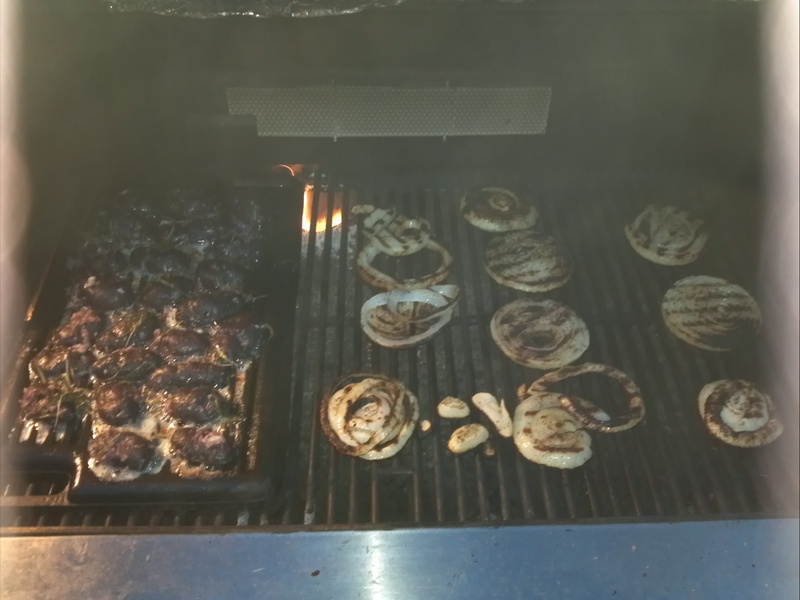 Fire up the grill to the hottest setting you have, take the meat out of your marinade, drop it on the hot grill and cook about 3-4 minutes a side. 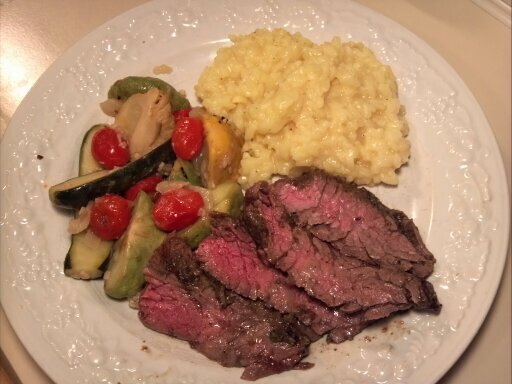 You’re looking for rare to medium rare on the steaks (125 F) at most. Take meat off the grill and let rest for about 15 minutes. 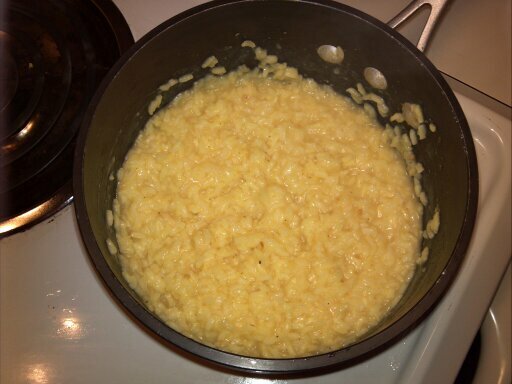 While the meat is resting, reheat the spicy caramelized onions, sauté some vegetables, check the rice and plate it up! 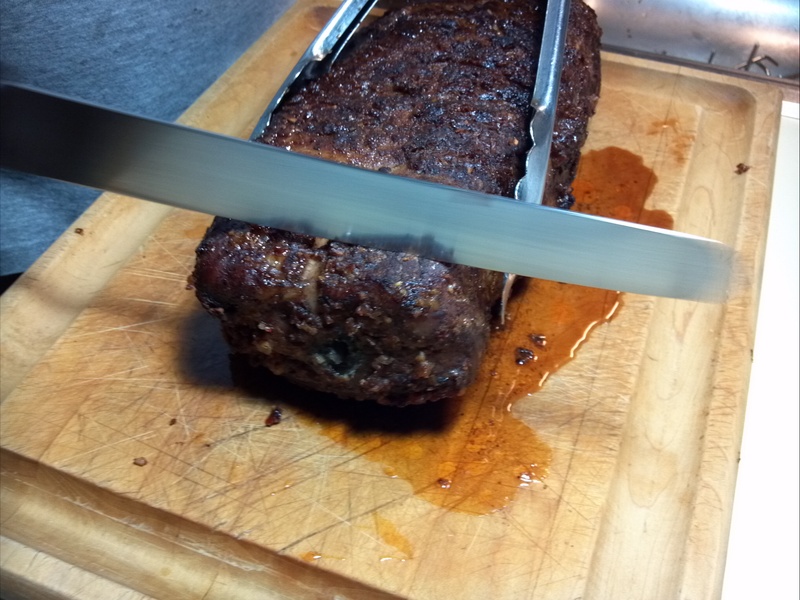 Lastly make sure after the meat rests to cut it across the grain or perpendicular to the striations in the meat. 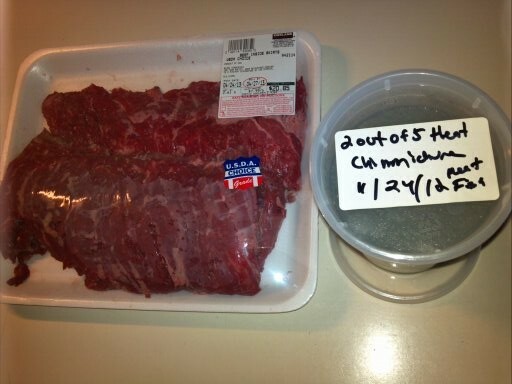 Otherwise you will end up with very chewy steak. 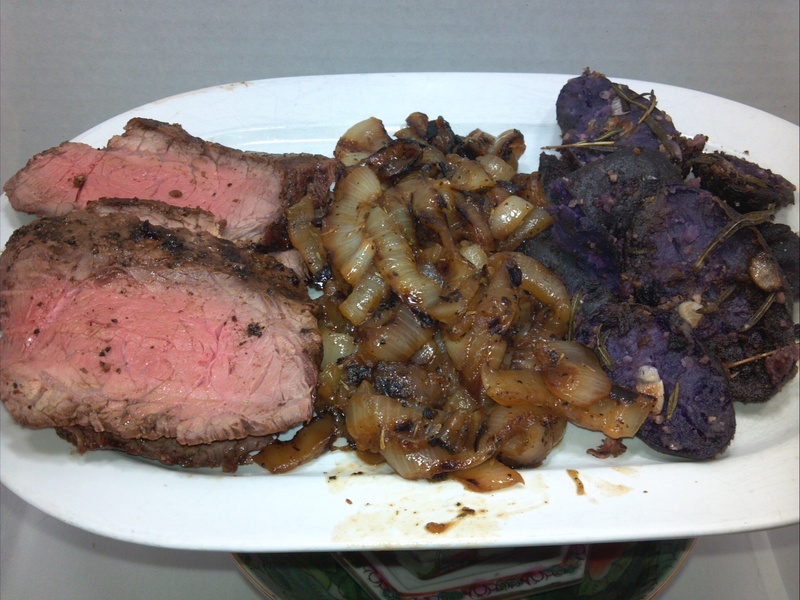 Enjoy with fresh sauteed vegetables, and the onions on the steak! 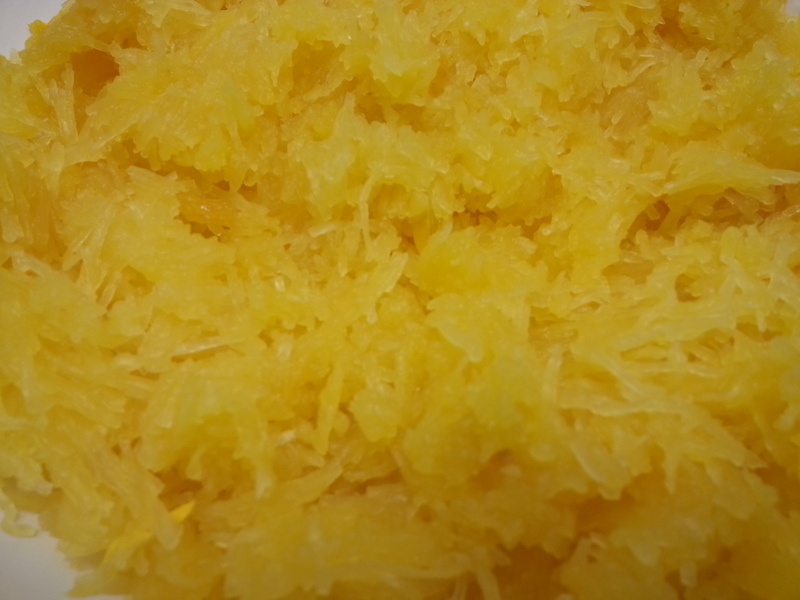 Spaghetti squash is something my wife likes and here is a quick way of fixing it. First cut in half from top to bottom (lengthwise), place the 2 halves cut side down in a glass dish that fits in the microwave. Add about ½ inch of water to the dish then cover with plastic wrap. Microwave on high 15 to 25 minutes until the skin is soft, uncover, flip over. Once cool to the touch with a spoon or knife remove the seeds from the halves and throw out. 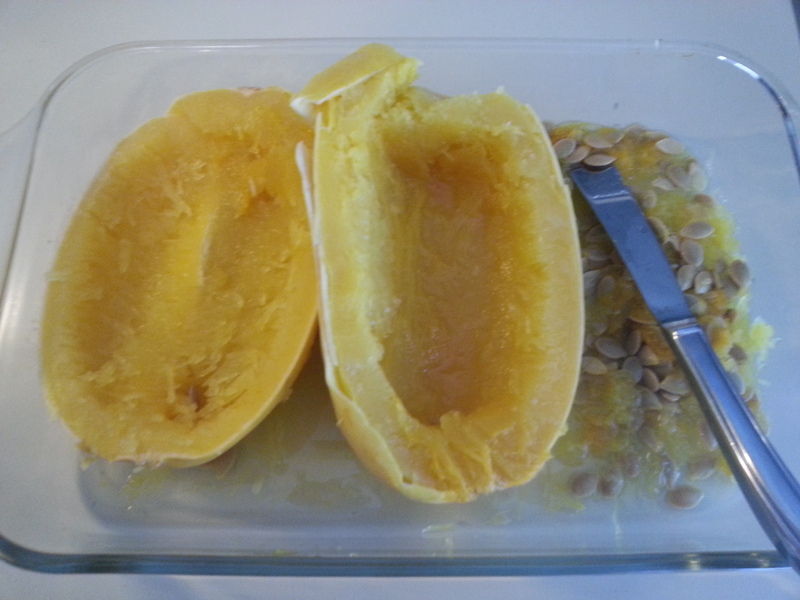 Now holding the squash, with a fork scrape out the insides, they will come out in long strands like in the picture, put in a sauté pan with some butter salt and pepper and cook until there is no liquid left in the pan. Serve in your favorite little bowl with a dash of salt and pepper to taste. There was an evening that my In-laws came over to look at what my beautiful wife had done to improve the garden. 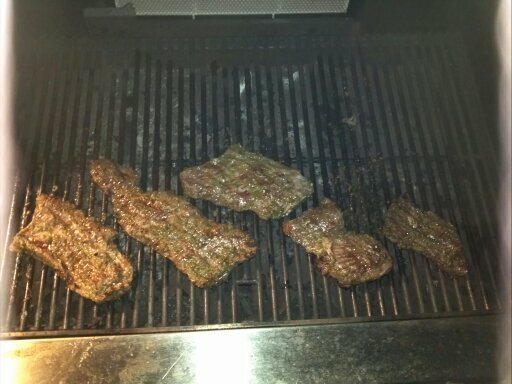 It got late so I offered to make them dinner. I threw some chicken on the grill (to make my mother in-law happy) but to make my father in-law happy (most important) I presented him with my favorite way to have asparagus (which he doesn’t like that much!) So as the girls were in the kitchen putting together a salad, the men were outside tending to the fire and I showed him this . 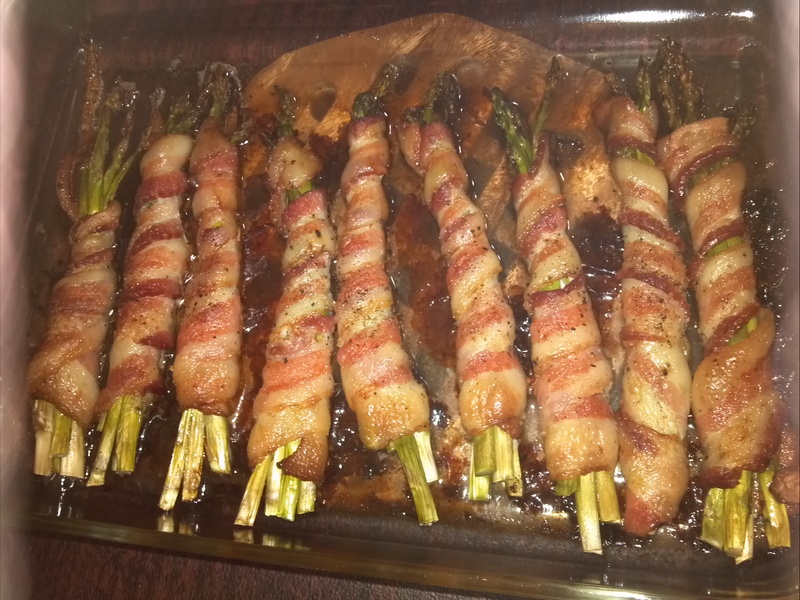 . . Bacon wrapped Asparagus – everything is better with bacon so here is how it goes. Trim the asparagus bottoms to get rid of the woody parts. Put the asparagus pieces in the freezer for 5 minutes. Carefully wrap bunches of 3 or 5 asparagus spears with a piece of bacon. 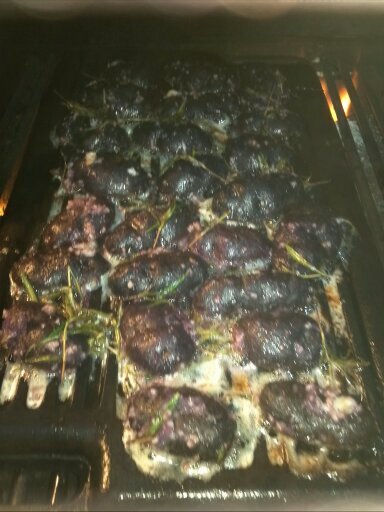 Dust the wrapped bundles with black pepper and place into a 450 degree oven. Cook to your preferred doneness on the bacon. For me and my wife, not too crispy. 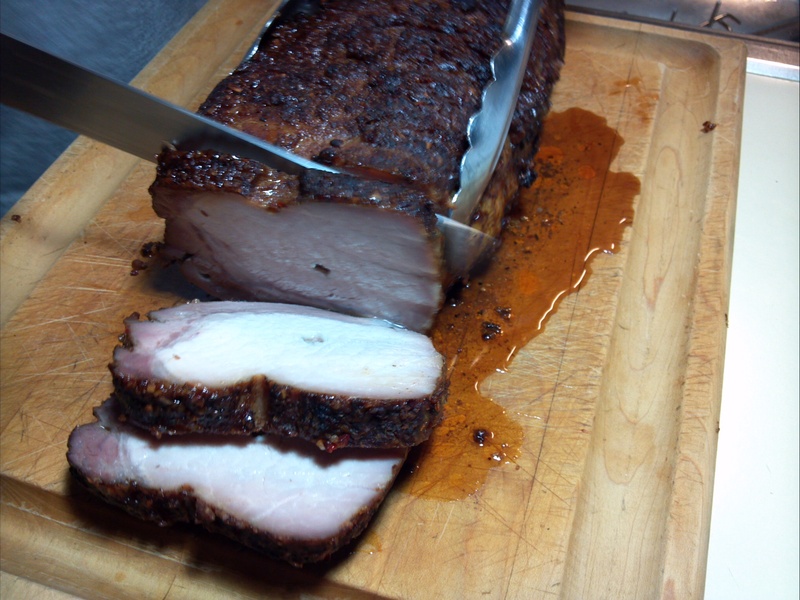 Put the platter of bacon wrapped goodness in the middle of the table as a side dish. All in all dinner was a success! 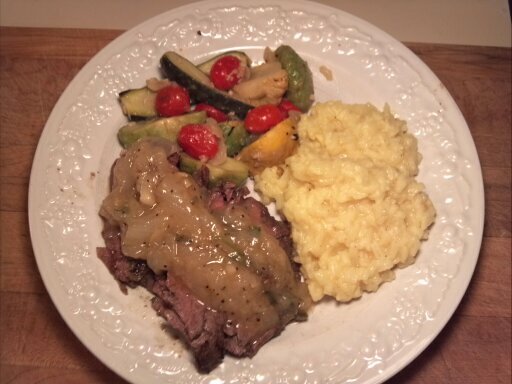 Well Labor Day is this coming weekend and here is a meal that is made with Red, White and Blue. 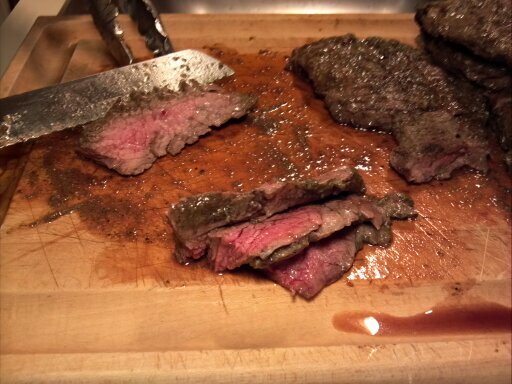 For the Red – a nice London Broil cooked to medium rare, just seasoned with salt & pepper. 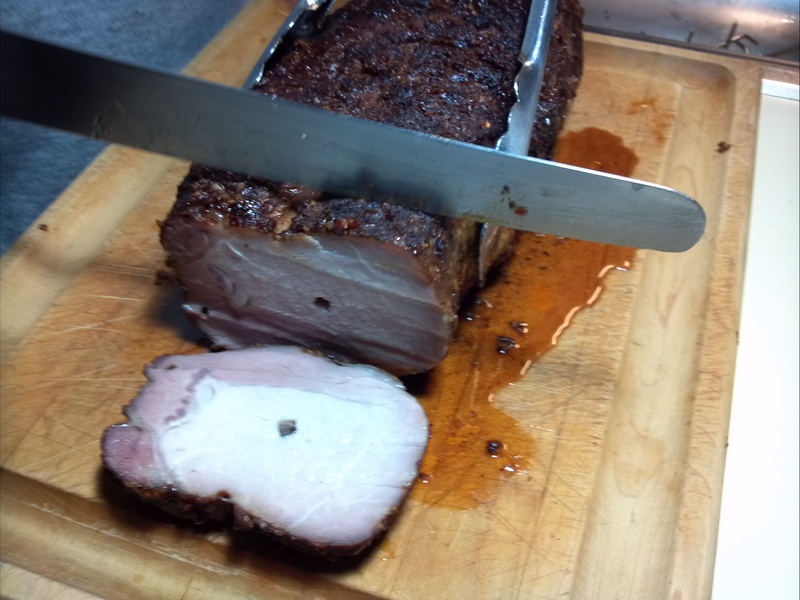 A common cut of meat we cook around my house. 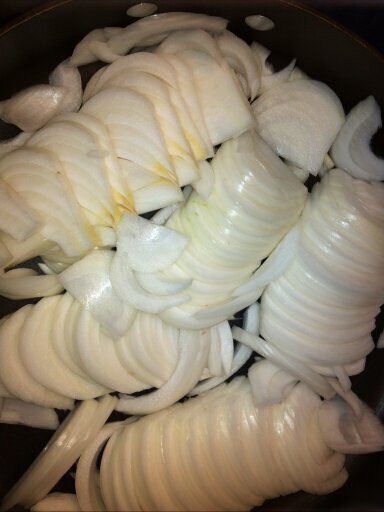 For the White – a few large sweet onions cut into rounds, brushed with olive oil, and salt & pepper. 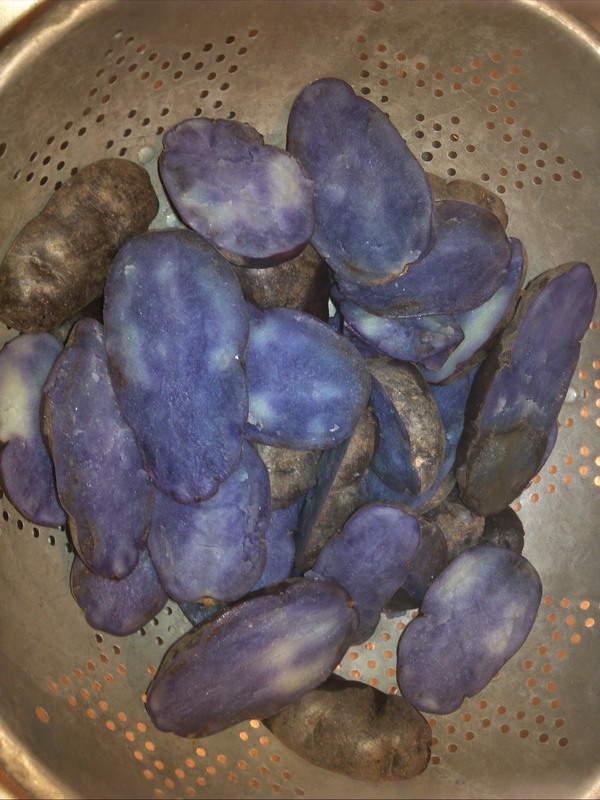 For the Blue – Par boil the Blue potatoes and them shock them in cold water. 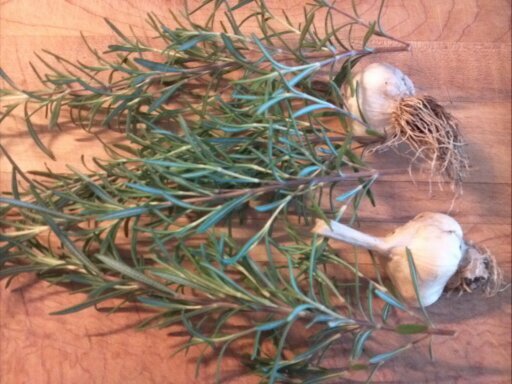 Next out to the garden to get some rosemary and garlic and a baby onion chop the garlic and onion place in a bowl drizzle with some good olive oil add some salt & pepper. 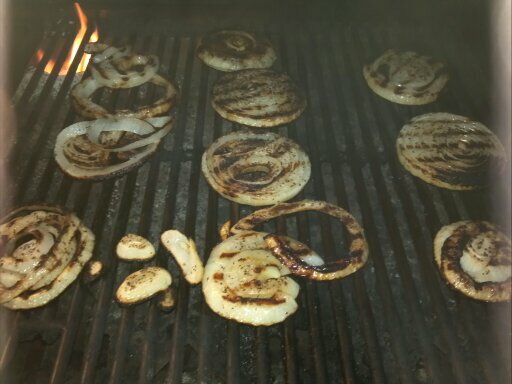 I have an iron grille plate that I heated medium hot on the grill place the potatoes on it cut side down for about 7 minutes then flip over for a few more. You can see that I was cooking the potatoes at the same time as the onions. 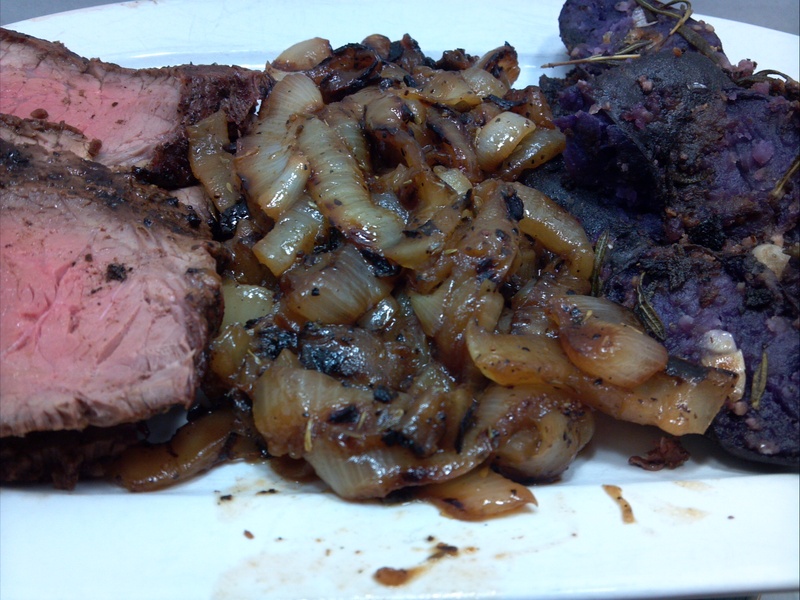 Cut the steak, unwrap the onions, and put the potatoes on the plate and enjoy. So I had to help out my neighbor for his daughter’s high school graduation party and she wanted a bread bowl with spinach & artichoke dip in it. So after some discussion her parents didn’t want all the kids hanging around the table with the dip so I came up with an idea. 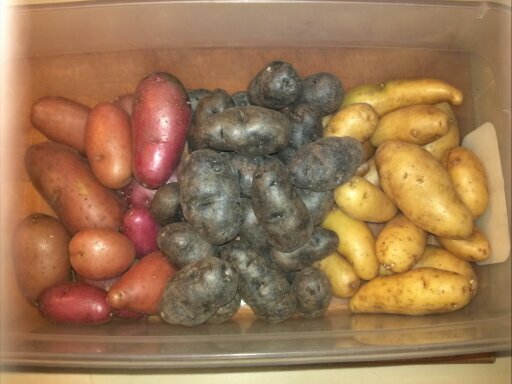 Using a pastry bag, pipe the mixture into the bottom, in this case, a 5 oz plastic cup and then arrange the vegetables however you like starting with the tallest in the back getting smaller as you go forward. 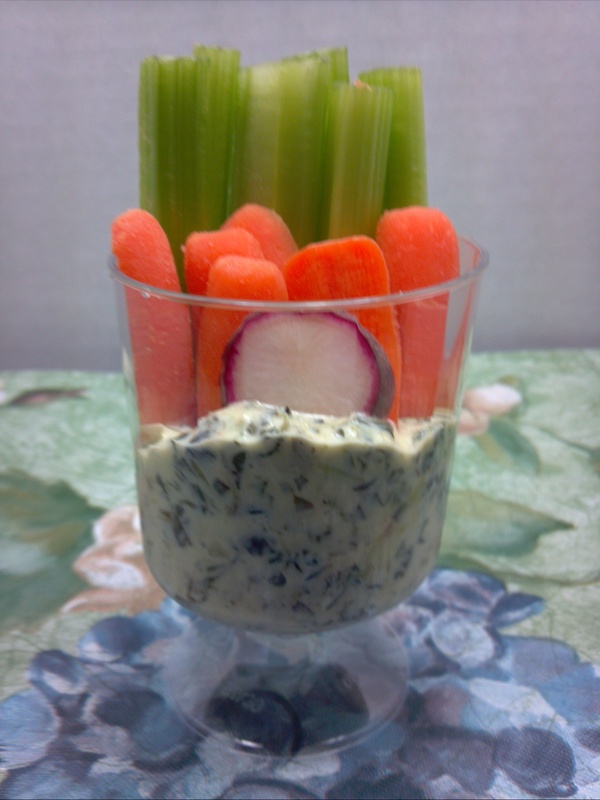 There you have individual vegetable dip cups that can be passed around. 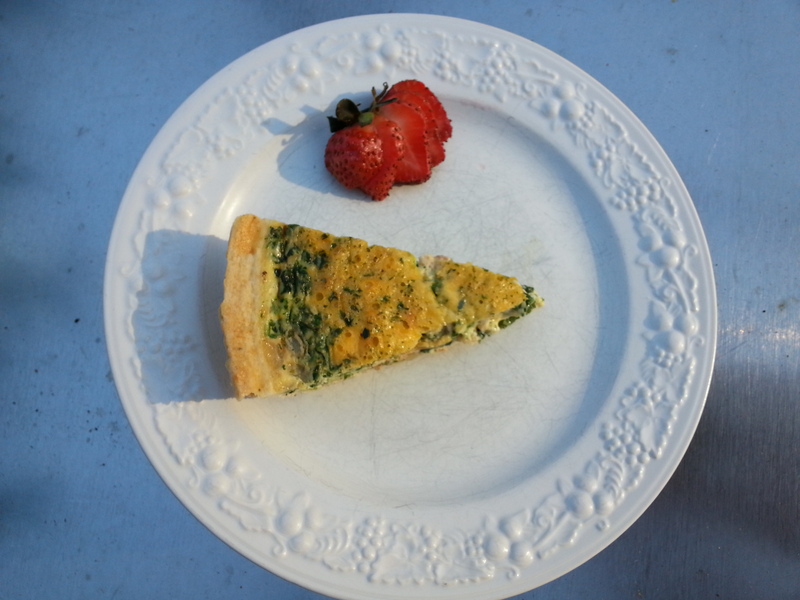 Here is an easy meal to put together that is good for you too! Compound Butter. Ahead of time make the compound butter. 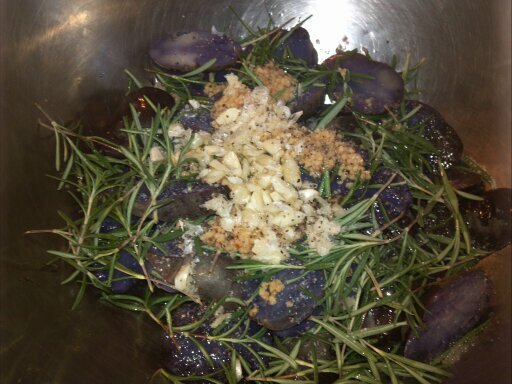 Mix together the butter, lemon juice, garlic, basil, parsley, salt and pepper. Place mixture on a piece of plastic wrap and roll into a log. Place in a freezer for an hour to set. After move the butter to the refrigerator. 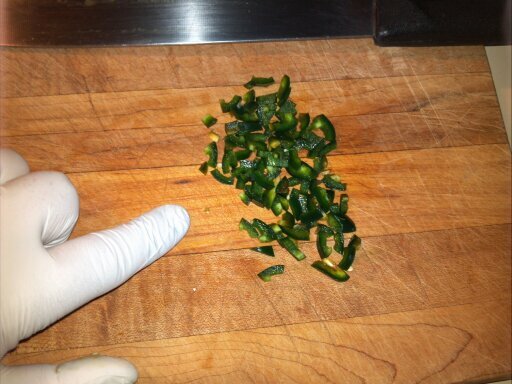 Add a pinch of salt and pepper for flavor. 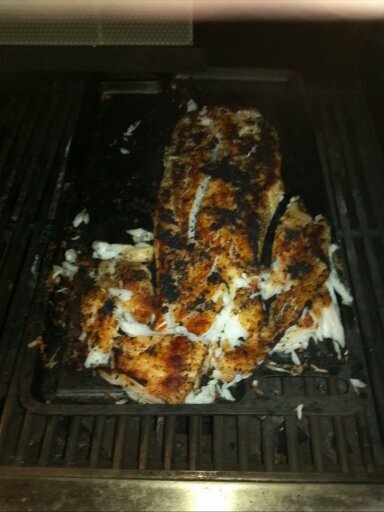 Rub a little oil on Corvina. Sprinkle the fish with the basil, thyme, lemon zest, salt and pepper. Let the fish rest for about 30 minutes. Preheat the grill to high heat, place a skillet on the grill. Place the fish on a skillet to sear. Cook on the first side for about 11 minutes. Then flip the fish over and cook for an additional 6-7 minutes. You know a white fish is cooked when the flesh flakes easily. 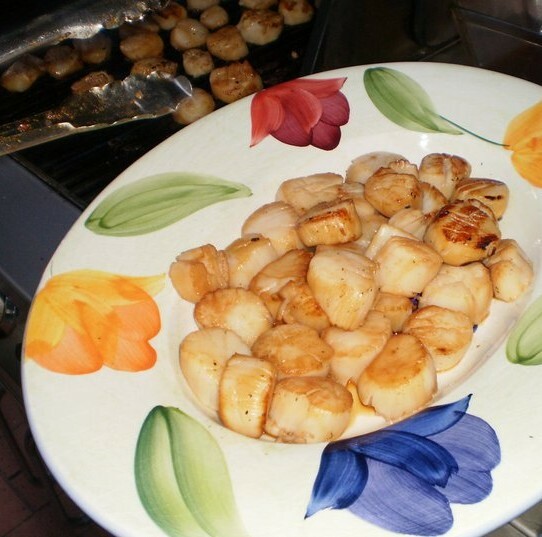 In a large sauté pan, add a tablespoon of butter and a tablespoon of olive oil. 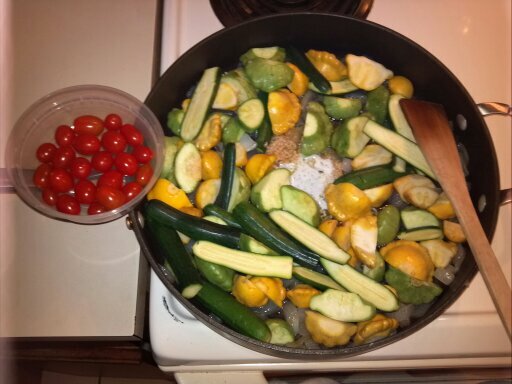 Add the zucchini, onions and patty pans. Cook the vegetables on medium high until they are about 3/4 of the way done. Add in the garlic and tomatoes into the pan. Finish cooking until the vegetables they are tender. 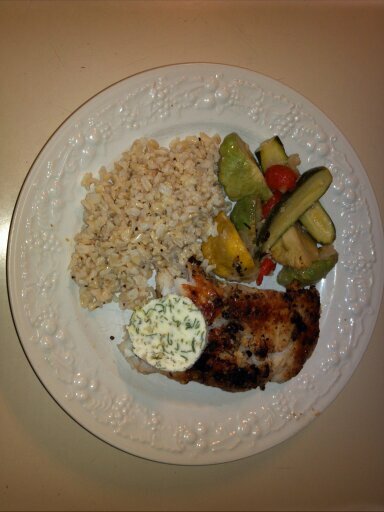 Put some of the brown rice on the plate, some of the vegetables, and garnish the fish with a slice of the compound butter. The cold butter melts over the hot fish making its own sauce.